You can add IEP goals and objectives for your students and associate specific activities to these goals so that you can track a student's performance toward these goals. 2. Select the Student ID link of the student whose IEP goals you want to add. The Student Profile page will open. 3. Select the IEP Goals tab. 4. Select Add Goal. The Add Goal dialog will open. 5. From the drop-down list, select either Select a sample IEP goal or Create a new goal. Select a sample IEP goal: From the drop-down list that opens, simply select one of the sample IEP goals. Create a New Goal: When you select this option, the Add Goal Dialog will expand. Enter one of the student’s IEP goals in the Goal text box. Shortcut: If the student’s goals exist in another system, simply copy the text from the other system and paste it into Goal text box. 6. 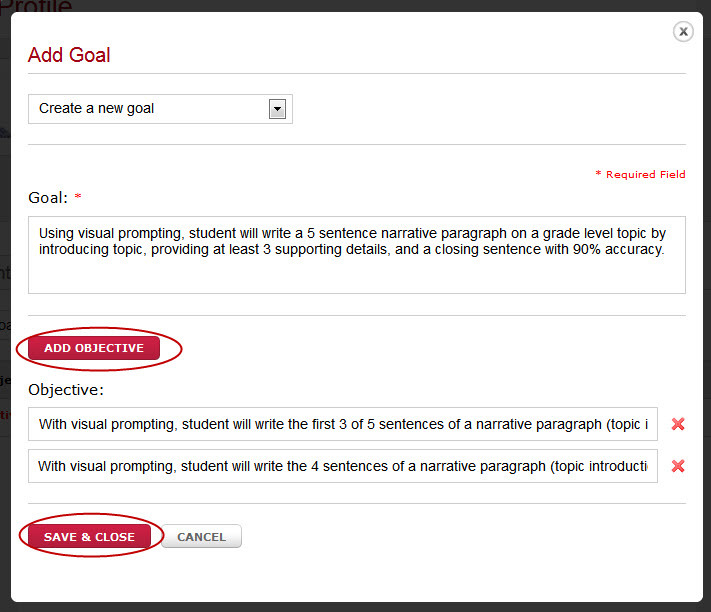 Select Add Objective, and, in the text box that opens, enter an objective for the IEP goal. Note: You may add as many objectives for each IEP goal as you like. Select Add Objective for each new objective you want to add. 7. Select Save & Close to add the IEP goal and its associated objectives to the student profile. Repeat steps 4 - 7 for each IEP goal you want to add.